Today is Remembrance Day. Remembrance Day has always been an important holiday for me and it is the one holiday that I am glad to say has not become commercialized. In reality, how can you commercialize death? How can you turn a holiday that is to thank all soldiers for their service into a commercial holiday? This year has been even more important after the shooting in Canada on October 22nd. It was a terrible event that strengthened Canadians and, by my own personal feelings, made us stronger. From Nov. 1 till Nov. 11, in Canada and many other Commonwealth countries, you can buy a poppy where the funds go to the veterans. It is a noble cause and one that I continue to support when I can. 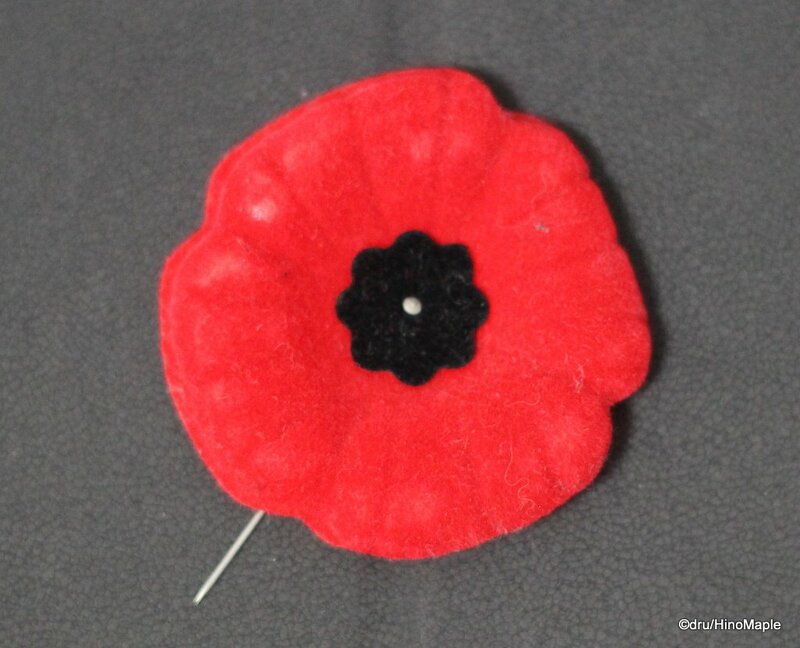 While I am not in Canada this year for the events, I will still be wearing my poppy proudly on Nov. 11 and being thankful that I am in a country that is relatively at peace with its neighbours. The following poem is the most important poem in Canada for Remembrance Day. This entry was posted in Culture and tagged November, Remember, Remembrance, Remembrance Day, Veteran's Day by Dru. Bookmark the permalink. I remember seeing the guests on The Graham Norton Show wearing the poppies last year and I had no idea what it was for. But this year I saw an article about the thousands of poppies that were placed in the moat of Tower of London and I finally figured it out. It was beautiful. That’s interesting that Remembrance Day and Veterans Day in the US are on the same day. Also glad you got to support your veterans through the pretty poppy. PS: Why the poppy though? Is it because poppies are mentioned in the poem? As for the poppy, you are correct.